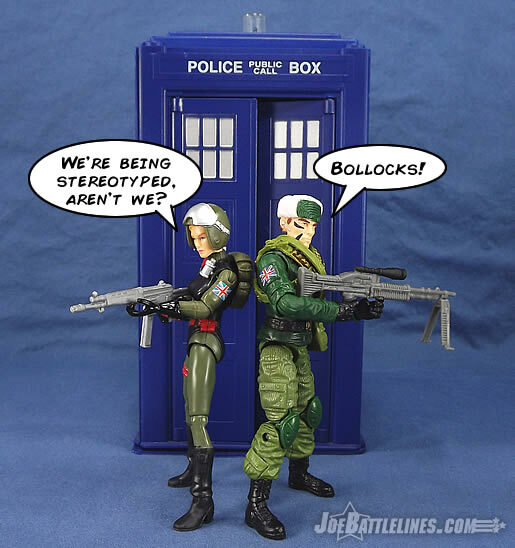 Given that bit of history, you’d think that the Club would have chosen wisely when it came to release Quarrel in the first series of Figure Subscription Service figures, right? Well—not so much. The Club has proven over the years that they are more concerned with form over function meaning that a figure’s appearance is a far greater priority than how useful its articulation may be or how well it integrates with its included accessories. Essentially, as long as it looks good in the package or placed in a static pose on a figure stand, the GIJCC designers seem to be content. These are, after all, adult collectibles, right? 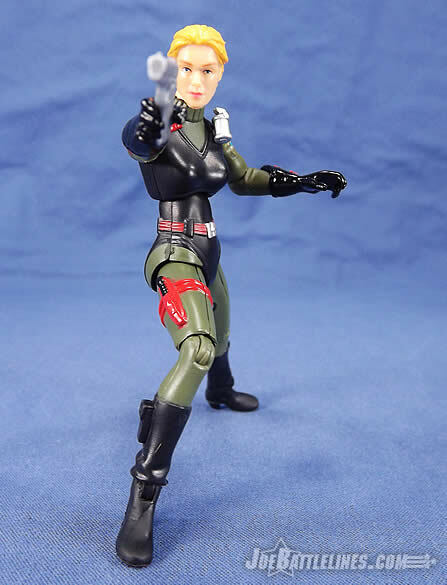 From the neck down, Quarrel is the 25th Anniversary Scarlett. As such, she’s inherited all of the strengths and weaknesses of that design. I won’t go into redundant detail here as I’ve linked to both the preproduction and final release reviews of that figure multiple times in this review. 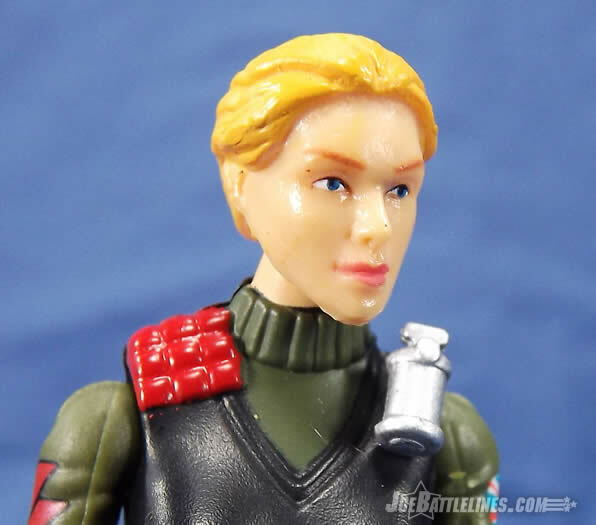 Rather than using any of the updated Scarlett bodies like the Resolute Scarlett or even the Rise of Cobra Reactive Armor Scarlett, the 25th body was chosen. 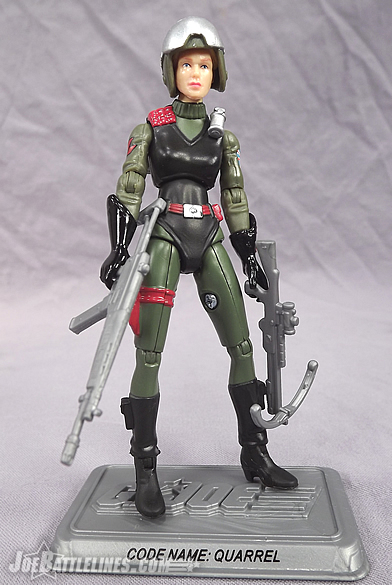 As such, Quarrel looks the part but simple tasks like sitting or holding her weapons just aren’t in her wheel house. She’s also perpetually in a wide-legged stance that just looks a bit unnatural the longer one looks at the figure. In addition, the placement of the mid-torso joint leaves her constantly slumping forward as if osteoporosis has already started to set in. Again, this was the “safe choice” for a figure body but I don’t feel as if it was the best choice. One thing I will point out is that deco is spot-on when compared to that of the original Quarrel with one welcome pair of exceptions. 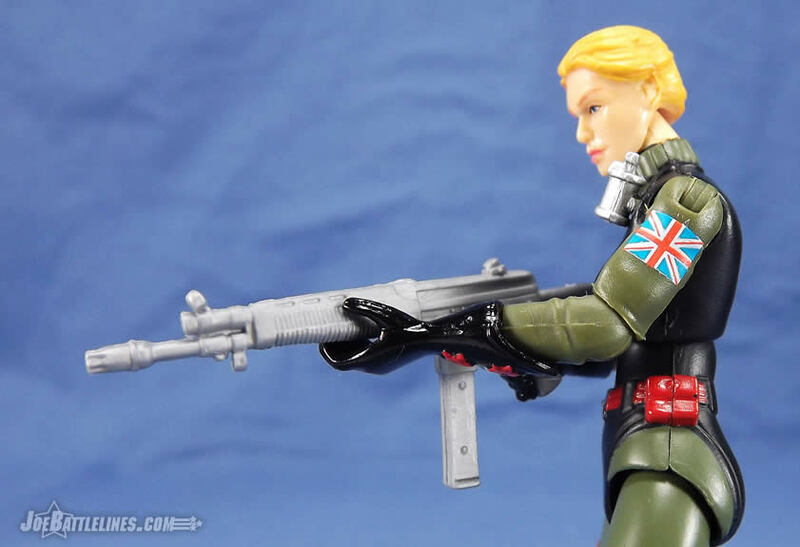 Whereas the original figure’s biceps were devoid of detail, the Club version now features two painted patches—the Union Jack and the Z-Force unit emblem. It’s a nice bit of extra detailing that pays homage to the character’s origins as part of Action Force! 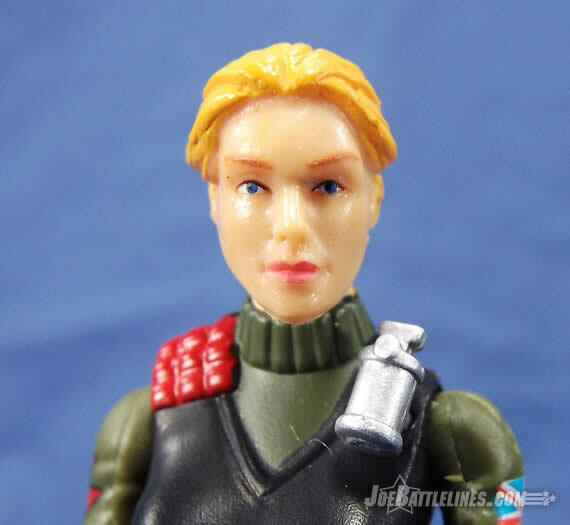 Quarrel has always been based on Scarlett parts and that tradition continues with the head sculpt of this figure. To create Quarrel, the Club chose to use the 25th Anniversary Pilot Scarlett head, this time with a blonde deco. 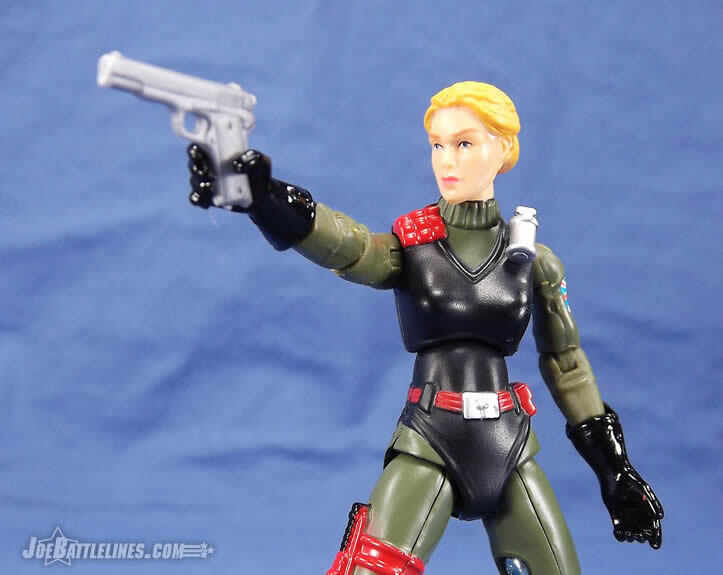 Now, considering that the original 1983 Quarrel was based on the 1983 swivel arm Scarlett which featured short hair, this makes a good deal of sense. 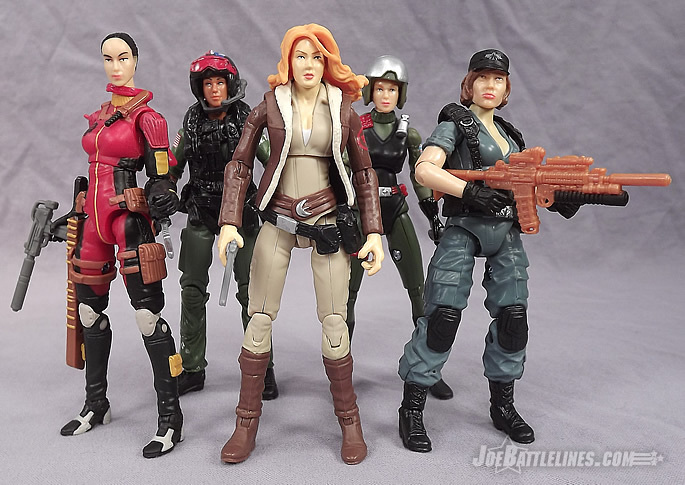 Purists will be happy that the Club’s tradition of strict adherence to the original designs has been maintained and the rest of the fandom will be happy that Quarrel looks “different enough” from Scarlett so as not to appear to the be result of one of Mindbender’s bizarre cloning experiments. 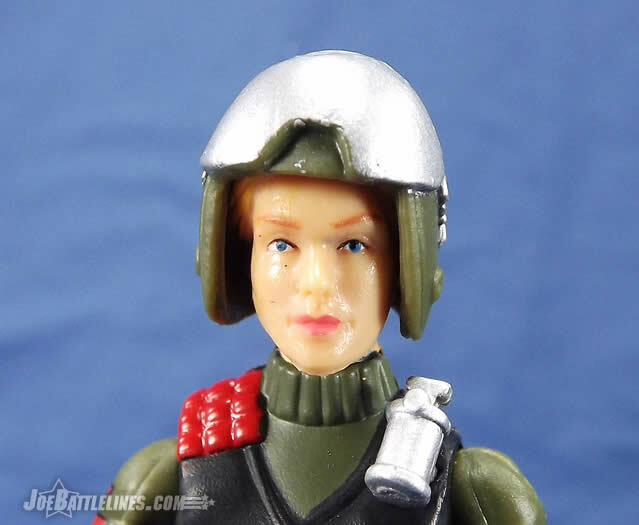 For the premium price I’d have liked to have seen a unique head sculpt for the character but that wasn’t in the Club’s wheel house for the first FSS. 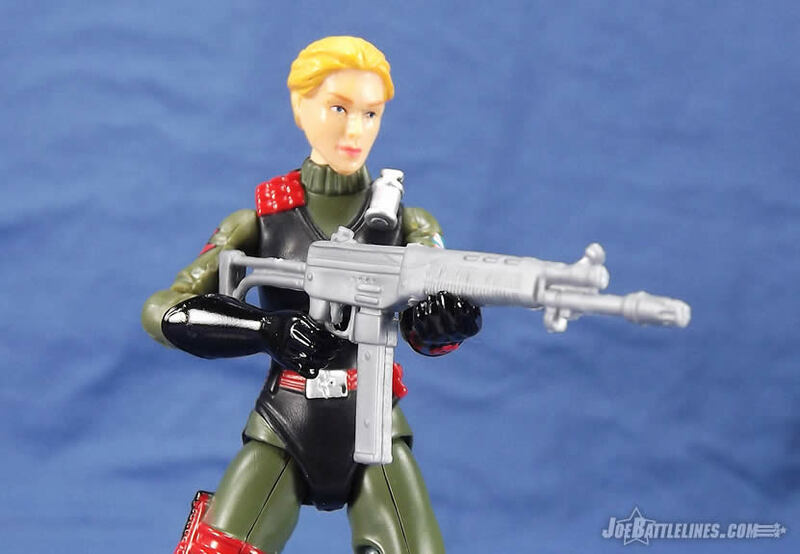 I find it ironic that this figure is packaged with the same crossbow that came with the Resolute Scarlett. (Apparently the body wasn’t available but the weapon was?) 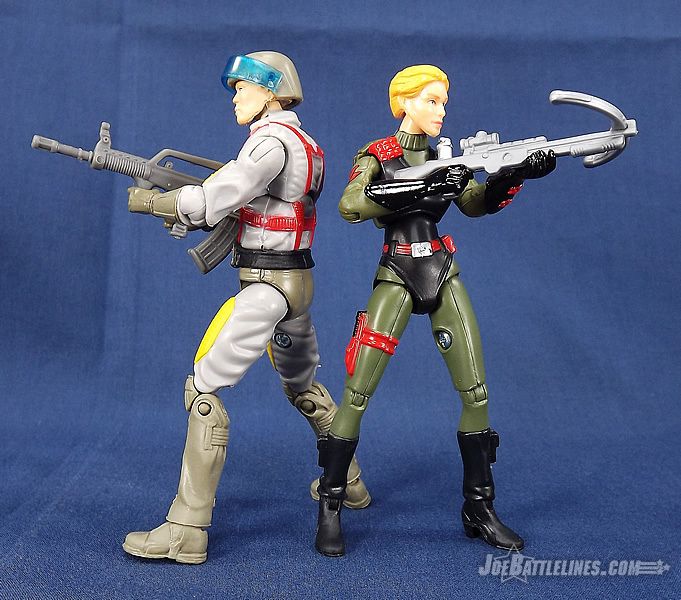 Still, it pays homage to the original kit while providing some differentiation from Scarlett. 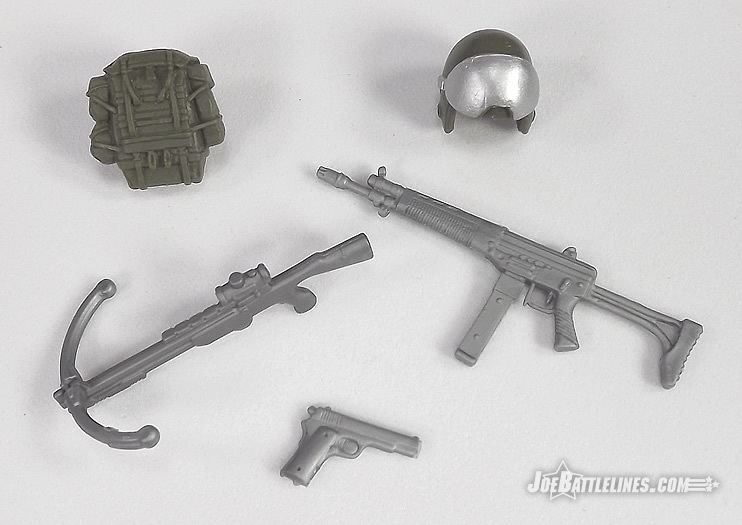 The assault rifle and pistol are weapon inclusions as well—even if the figure’s hands have a devil of a time holding them. For the post part I’ve had to pose the figure with the weapons in two-handed grips simply because the hands and weapons weren’t really designed to go together. (It’s a combination of softer plastic and a wide c-grip.) Still, what’s included works well enough—just as long as you don’t plan on moving the figure around too much. 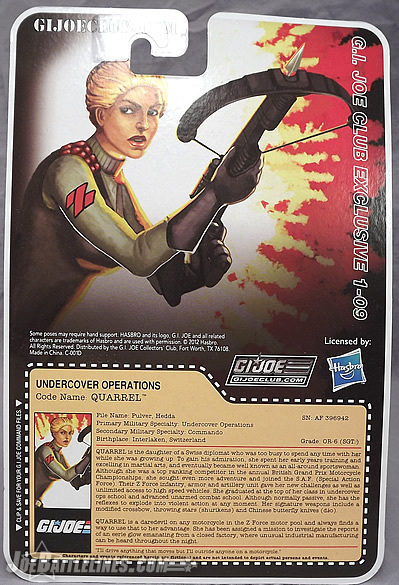 Quarrel was one of the earliest announced figures in the G.I. 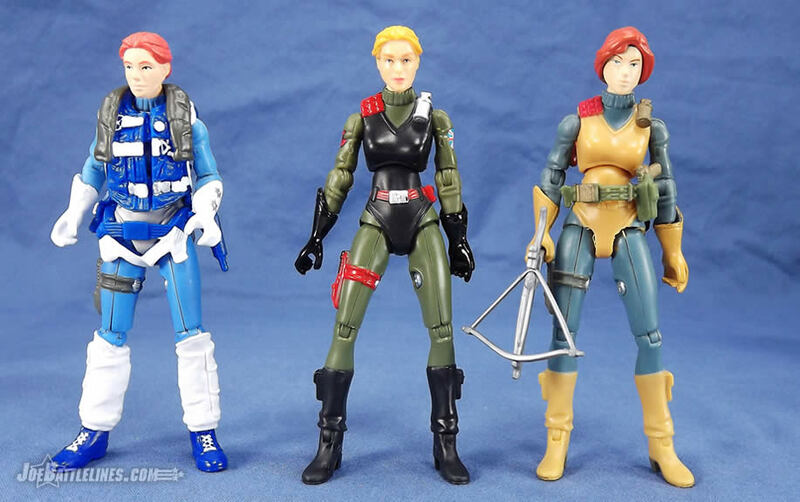 Joe Collector’s Club debut FSS series. 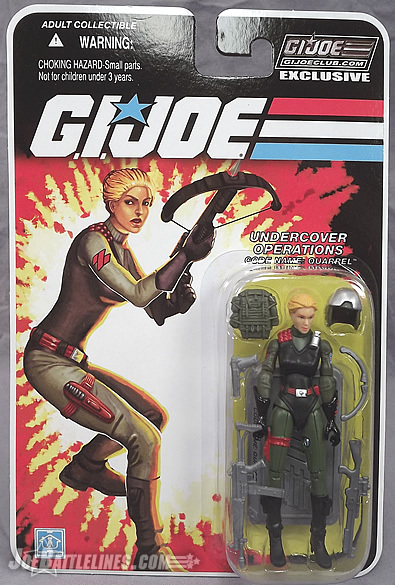 She was relatively easy to produce, was a fan favorite character of international collectors, and required no new tooling. From the standpoint of form this figure absolutely fits the bill and looks great standing on a figure shelf. 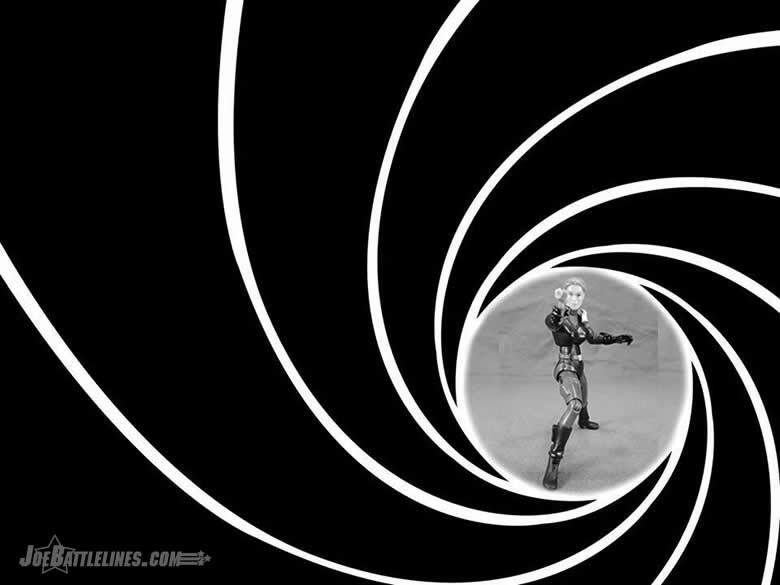 In terms of function, she’s lacking in both articulation and the ability to hold her weapons. At the end of the day I find myself leaning more in favor of the figure than I am against, with the caveat that she really wasn’t worth the premium price the Club charged for her at the time. With no new parts, the cost of close to then $28.00 was honestly a bit high for what was essentially a straight repaint. When compared to other direct-to-collector lines like Mattel’s Masters of the Universe Classics, the value/price figure just wasn’t there. Still, in retrospect she’s a good-looking figure if she can be obtained at a reasonable price. Of course, that’s just this Joe fan’s opinion. The Bottom Line: Quarrel looks good but ultimately suffers from the same problems that plagued the 25th Scarlett. 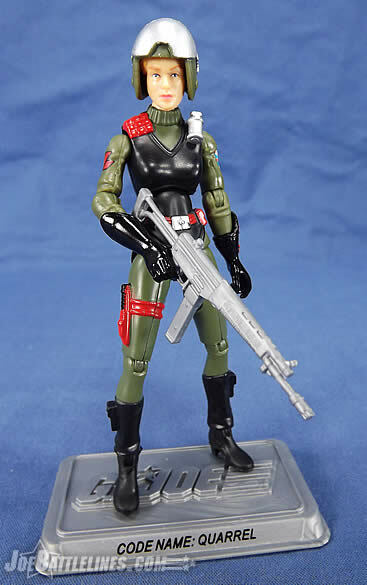 A good figure if she can be found for a reasonable price but I wouldn’t over-pay for her.